As one travels around Japan, one cannot help being struck by how many people are on the move, especially by train. And this mobile people needs to be fed. Vending machines are everywhere in Japan, and they are well used. For the most part they sell teas of all types, sodas, juices and various types of coffee, hot and cold. Before the advent of convenience stores, which are far more ubiquitous than in the US, you could buy food, beer and even hard liquor in vending machines, but that is rare these days. Here is a typical selection. 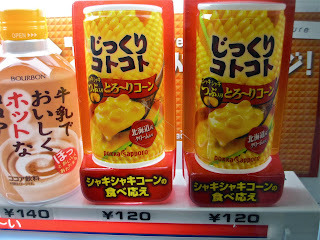 One item caught my eye at Nasu station, north of Tokyo: hot corn soup. I shook it and tasted a can, but found the soup to be thin and devoid of corn taste or texture. Another member of the tour was enjoying his can, and urged me to shake harder; this released the sweet, starchy kernels of corn and it turned out to be . . . well, not bad. Japan's train stations are full of takeout food stores and kiosks, and many styles of bento boxes, or ekiben, may be found, some of which can be quite elaborate. The better ones vary with the region and the season. 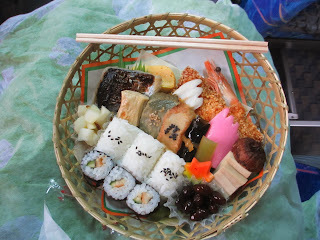 We largely traveled by bus, and were provided bento boxes or sandwiches by our guide. Here's the best one we had, on the bus between Kyoto and Tamba, an old ceramics center about an hour away, rather precariously balanced on my lap. Although fast food chains have made great gains in Japan, you can still find interesting pre-prepared food all over. This adds an interesting dimension to the experience of traveling around the country.